Hurricane Sandy may have forced Google to cancel the New York event, but even the storm can't stop LG from announcing the Nexus 4. The phone leaked extensively, so there's little about it that's unknown (it's based on the LG Optimus G), but let's go over the specs one last time. 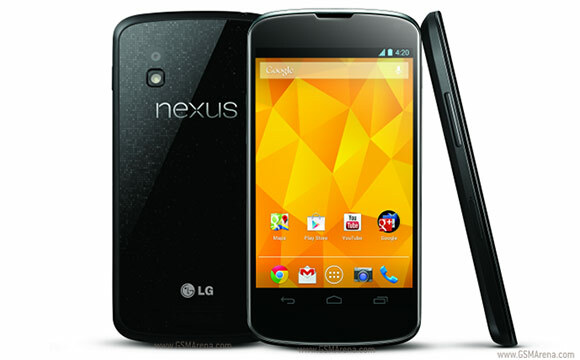 The LG Nexus 4 has a 4.7" True HD IPS Plus screen with WXGA resolution (768 x 1280, 15:9 aspect ratio). It's powered by a Snapdragon S4 Pro chipset with four Krait cores at 1.5GHz, 2GB RAM and Adreno 320 GPU. The phone is running Android 4.2 Jelly Bean (so no Key Lime Pie) and you get a choice between 8GB and 16GB storage options (there's no microSD card). The camera on the back has an 8MP sensor and it has a cool feature called Photo Sphere. It's like a panorama, but you can snap photos in every direction you like - sideways, upside-down, wherever. The Nexus 4 measures 133.9 x 68.7 x 9.1mm and weighs 139g. It has a 2,100mAh battery, which has enough juice for 15.3 hours of talk time or 390 hours of standby. The phone supports wireless charging. As far as connectivity goes, the LG-made Google Nexus 4 will have GSM/HSPA+ and NFC (unlike the Optimus G, there's no LTE). We suspect there will be a CDMA version later on, but there's no info on that just yet. The first LG Nexus 4 phones will be available from the Play Store in US, UK, Canada, Germany, France, Spain and Australia starting November 13. If you prefer brick and mortar stores, the you'll have to wait until the end of November when the Nexus will hit Europe, Central/South Americas, Asia, CIS and the Middle East. The 8GB version (unlocked) is priced at $299, while the 16GB version is $349. T-Mobile USA will carrythe 16GB LG Nexus 4, though with a price of $199 and a 2-year contract, it doesn't sound like much of a deal.